Price: £7.45 (incl VAT) Sorry, this item is currently unavailable. Click here to receive notification when this product comes back into stock. 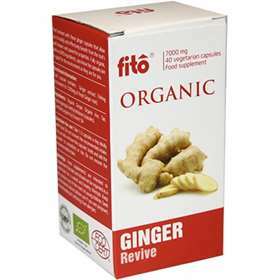 Fito Organic Ginger Capsules 40 are a natural food supplement that contains 744mg of Ginger extract. Fito Ginger capsules allow you to easily benefit from the roots well-known properties. Each capsule contains Ginger Extract 744mg. Fully Organic with no GMO ingredients. Take 1-2 capsules a day, ideally with food. Do not exceed the recommended intake. Seek professional advice before use if you are pregnant, breastfeeding or suffering from allergies. Food supplement are intended to supplement the diet and should not be regarded as a substitute for a varied and healthy lifestyle. Organic Ginger, Organic rice, Talc, hydroxylpropyl methylcellulose (capsules). *Certified organic by EcoCert SA. Product code: 77151 Price: £7.45 (incl VAT) Sorry, this item is currently unavailable. Click here to receive notification when this product comes back into stock.